Take in a fantastic day, with taxi Inverness going west, we can take in the world famous Urquhart and Eilean Donan castles, while traveling along the equally famous Lochness corkscrew roads, while nessie hunting on the way. 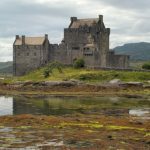 Going West can be a full day tour all the way to the wonderful Isle of Skye or a simple 2-4 hour tour around Lochness taking in the wonderful castles and breath taking scenery. Whatever you choose you can make it you own. A wonderful drive to Dunrobin Castle maybe? taking a dram or 2 along the way at the Dalmore distillery or the World famous Glenmorangie Distillery. Then on to Dunrobin castle to see the spectacular falconry Display before taking in the Duke of Sutherland’s ancestry with a tour around the famous Castle and its centuries of History. Maybe stopping in at the quaint village of Dornoch with its Historical ties to Royalty and its quaint shopping in the Jailhouse and quirky little side shops offering local artifacts and shopping. Eilean Donan Castle sits at the point where three Scottish Lochs Meet, Scotland’s Most Romantic Castle. In a superbly beautiful and romantic setting, Eilean Donan Castle possesses a dream like quality. The most photographed castle in the world? Certainly Eilean Donan is Scotland’s most romantic and recognizable. Although the island of Eilean Donan has been a fortified site for at least eight hundred years, the present building dates largely from the early 20th century. Today’s castle, which rose from the ruins of it’s predecessor, was rebuilt between 1912 and 1932 by Lieutenant Colonel John MacRae-Gilstrap. Eilean Donan is quite unique, the product of an incredible feat of determination and devotion to restore the Castle for the MacRae family. It is hard to believe that the present castle has yet to celebrate its 100 birthday, but easy to be absorbed by the atmosphere of a place which has stood witness to so much history.